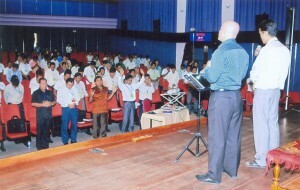 Across Asia we participate in Pastor/Leadership Training and Development. We regularly speak in Conferences, Seminars and Schools in Vietnam, Cambodia, Malaysia and also in Mozambique, Panama, China and the Philippines. We facilitate ministry opportunities by connecting others with our partners across Asia. If you are interested in ministering in any of our target nations, click here, to begin a conversation, which could take you beyond and into a new and developing ministry across Asia. We are committed to training pastors, leaders and church planters across Asia. Your sponsorship is invited for the conferences and schools in the various nations. Because of local conditions in some of the nations we work, it is not possible to include all details in some listings (details are available on request). Click here to support a Leadership Conference now. To inquire about booking a speaker for your Pastor’s/Leader’s Conference, School or Bible College please click here.